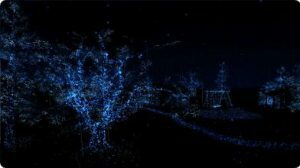 Arte Experience presents: Notes On Blindness, a virtual reality journey into a world beyond sight. In 1983, after decades of steady deterioration, John Hull became totally blind. To help him make sense of the upheaval in his life, he began documenting his experiences on audio cassette. These original diary recordings form the basis of this six-part VR experience, an interactive non fiction using new forms of storytelling and gameplay mechanics to explore his cognitive and emotional experience of blindness. Each chapter will address a memory, a moment and a specific location from John’s audio diary, using binaural audio and real time 3D animations to create a fully immersive experience in a ‘world beyond sight’. Notes on BlindnessVR is viewable with or without virtual reality headset (cardboard mode or smartphone mode). Notes on BlindnessVR is available in English, French and German. Runs on iPhone 5 (or later) and Ipad 5 (or later). Requires iOS 9.3.4 or later versions. For full user experience, please use headphones, raise the volume and increase the luminosity of your phone. Notes On BlindnessVR is produced by Ex Nihilo, ARTE France, and the French startup AudioGaming, in co-production with Archer’s Mark. It has been supported by the TFI New Media Fund and Ford Foundation – JustFilms, Centre National du Cinéma et de l’Image Animée (CNC) and Région Midi-Pyrénées. I don’t think I have ever seen an app that I would recommend more! I see the world in a whole new way now! I think I will also interact with my friends differently because of this too. My blind friends and I can hear the world together and I don’t have to see it for them the way I have been.